The lucky winner of our 2015 BREAKFAST CLUB RAFFLE is Claudette Dunn. Claudette will enjoy Breakfast-for-Two from 12 wonderful local restaurants over the next 12 months. The restaurants include: Cafe 1, Little River Inn, Mendocino Hotel, Dolphin Isle Cafe, Homestyle, Headlands Coffeehouse, Cucina Verona, Eggheads, Laurel Deli, David's, Flow Restaurant and MacCallum House. We received an new electric pallet jack funded by a Community Development Block Grant with the help of the City of Fort Bragg. The pallet jack will be used in the back of our large truck, to prevent driver injury when moving very heavy pallets of canned goods. 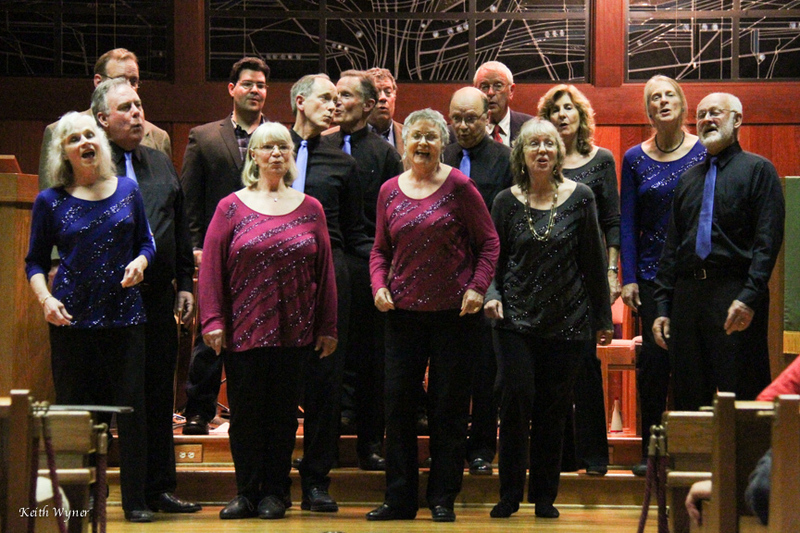 Thank you to: The 1st Presbyterian Church, Mervin Gilbert, Steve Worthen, The Acafellas, The New Four, In the Mix, The Mendocino Coast Brass Ensemble, Starbucks and many more!!! 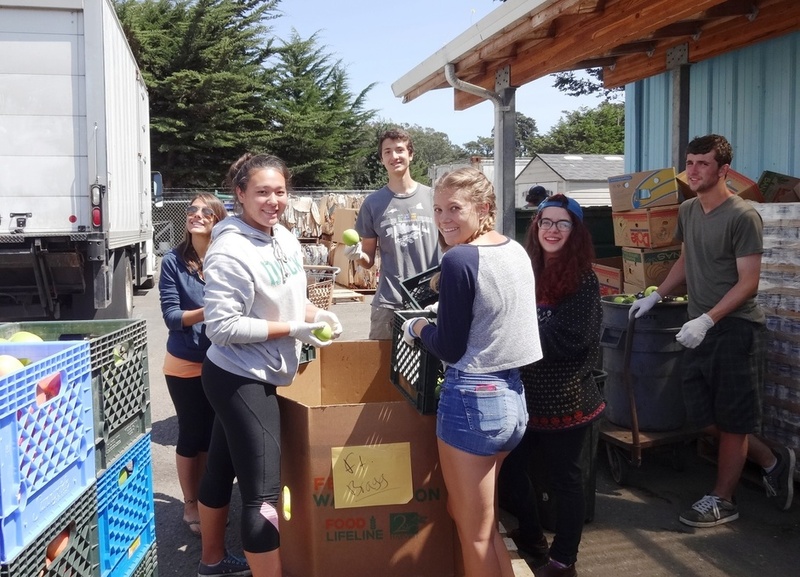 Breakfasts donated by: Cafe One, Little River Inn, Mendocino Hotel, Cucina Verona, JJ's Family Dining, Sandpiper House, Queenie's Roadhouse Cafe, David's, Eggheads, Laurel Deli & Desserts, Flow, Headlands Coffeehouse and MacCallum House. 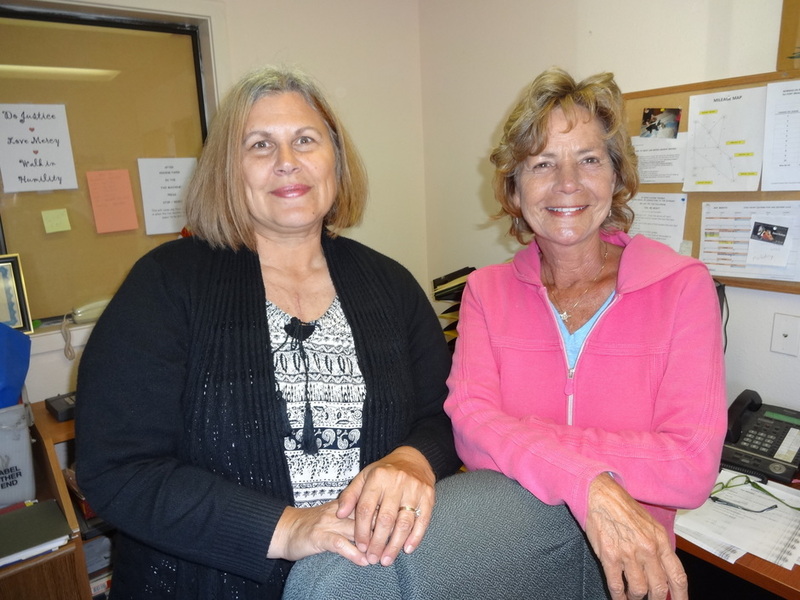 The Season of Sharing annual appeal spearheaded by Sharon DiMauro of the Fort Bragg Advocate News and sponsored by the Community Foundation of Mendocino County brought in $20,665 this year. Needless to say this is a hugely significant donation to the Food Bank for which we are tremendously grateful. These generous businesses will match your donations of $200 or more. The proceeds of this annual campaign will be used to buy turkeys with all the fixin's for a Delicious & Nutritous Holiday Meal for Food Bank client families. 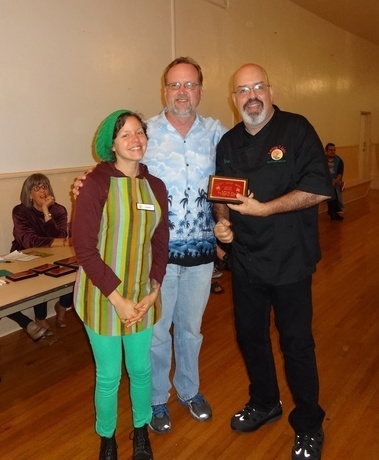 General Category: 1st Place Soup, Ginabelle Smith - Smoked Salmon Chowder; 2nd Place Soup, Betty Stechmeyer - Mint, Spice & Blackberry Soup; 1st Place Chili, Bob Toy; 2nd Place Chili: Jessie Morris. We're getting some fabulous entries for our 2nd Annual SOUP & CHILI COOK-OFF (Oct 19). In the professional category, so far, we have: returning 2012 1st & 2nd place winners in the soup category, Living Light and Little River Inn as well as Wild Fish, and Raven's. Wow! My mouth is already watering. In the non-professional category we have 1st & 2nd place winners in the chili category, Josh Richardson of Edward Jones and the Savings Bank, Fort Bragg Branch. 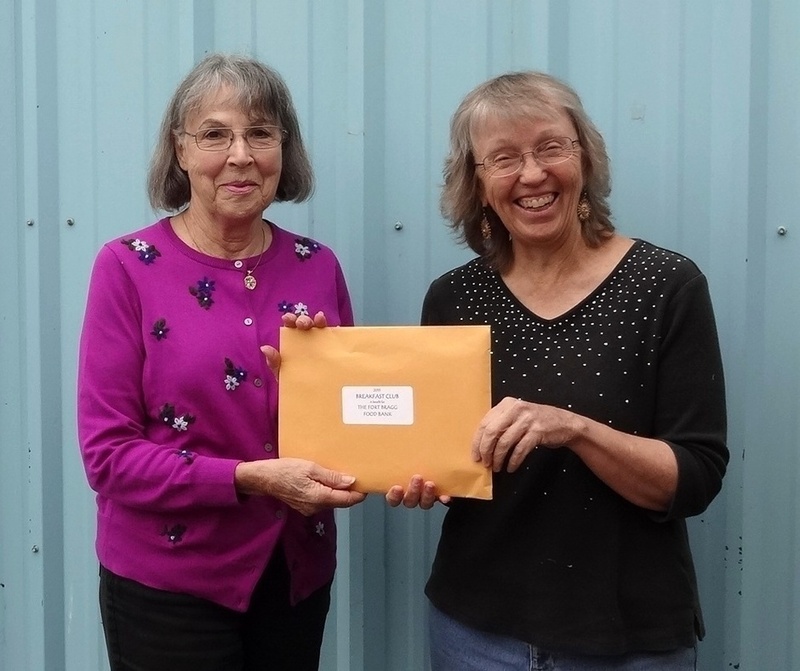 Also entering are Claudelle Zack, Betty Stechmeyer, Carol Millsap of State Farm Insurance, Brenda Barrett of Coast Pack & Ship, Marty Johnson, and James Warren - with new entries every day! We welcome our new long-distance truck driver, Felicia Molina! Felicia has experience in driving a large truck like our new Freightliner so she's taking to the job like a duck to water. We also were re-joined by returning employee Sarah Naples in June. Welcome aboard, Sarah and Felicia! We said good-bye to two wonderful staff members this summer: Hilary Miller, administrative assistant extraordinaire, retired after 5 years of employment preceded by a couple of years of volunteering. Joe Odegaard, our wonderful long-distance truck driver left for more lucrative employment in architectural engineering. 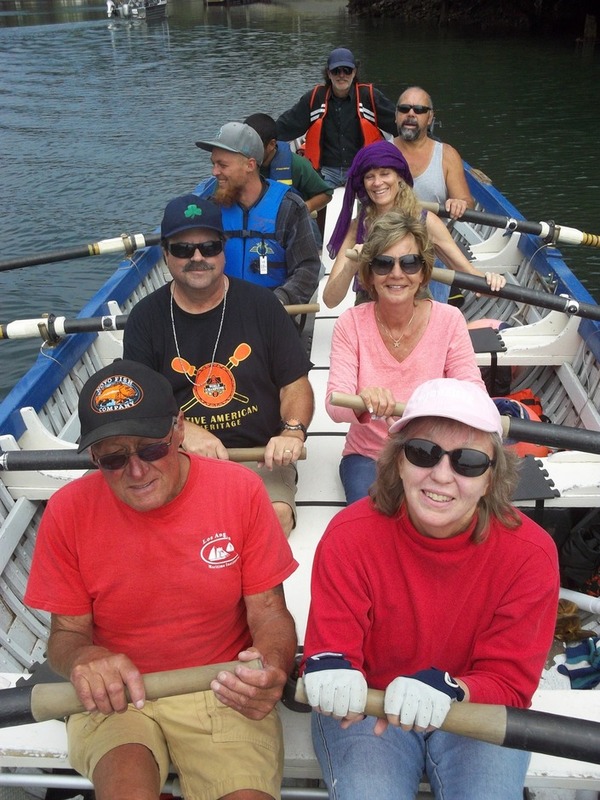 We also lost Volunteer/Client Coordinator Amanda Frisica in June. These excellent staff members will be greatly missed ! Barbara Knapp is the lucky winner of our 1st Annual Breakfast Club Raffle ! Over the next year, she will enjoy Breakfast-for-Two donated by the following twelve local restaurants: Cafe 1, David's, Eggheads, Headlands Coffeehouse, Home Style Cafe, JJ's Family Dining, Laurel Deli & Desserts, Little River Inn, MacCallum House, Mendocino Hotel Garden Cafe, Queenies Roadhouse Cafe, and Sportsman's Dock Restaurant. Bon Appetit, Barbara! 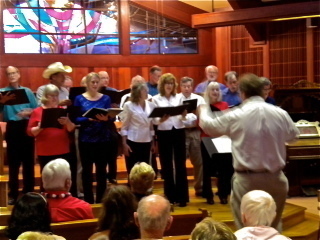 SPIRIT OF AMERICA CONCERT - Lots of Fun! Dan Fowler, Food Bank president, directs members of Acafellas, In the Mix and Four in a Chord plus LIndy Peters in a rousing rendition of This Land Is Your Land. Twelve local restaurants have donated gift certificates for Breakfast for Two for our brand new Breakfast Club Raffle. A big thank you to: Cafe 1, David's, Eggheads, Headlands Coffeehouse, Home Style Cafe, Laurel Deli, Little River Inn, MacCallum House, Mendocino Hotel Garden Cafe, Queenie's Roadhouse Cafe, Sportsman's Dock Retaurant and JJ's Family Dining. This is very cool! Just when you couldn’t think of another way Harvest Market could find to support our Food Bank! At the checkout register you have the opportunity to donate your 10 cent credit for using a re-useable bag (or the 10 cents you pay for a large paper bag) to one of four local good causes, including the Food Bank. Your checker will give you a wooden token that you take to the Customer Service counter and place in the box of the charity of your choice. HARVEST MARKET DONATES A TRUCK ! Pictured left to right, from the Food Bank: warehouse manager Jim DiMauro, board president Dan Fowler, and board vice president/secretary Thom Adams; from Harvest Market: Tom Honer, Jennifer Bosma and Tim Bosma. WOW! 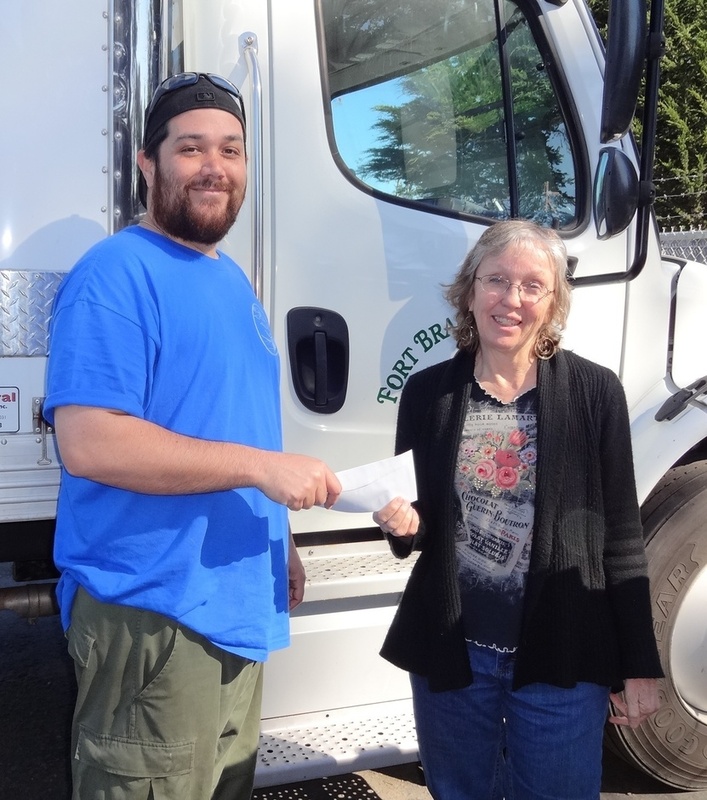 The Fort Bragg Food Bank was thrilled to receive a 2005 Isuzu truck generously donated by Harvest Market. The truck is in excellent condition with low mileage and will serve the Food Bank and the community for many years to come. Replacing the Food Bank’s last remaining old worn-out vehicle, it will be used daily to pick up donated food from local stores, including Harvest Market, as well as to deliver food to small remote food pantries county-wide. THANK YOU HARVEST MARKET ! This was the 4th year of this fun and fabulous event. 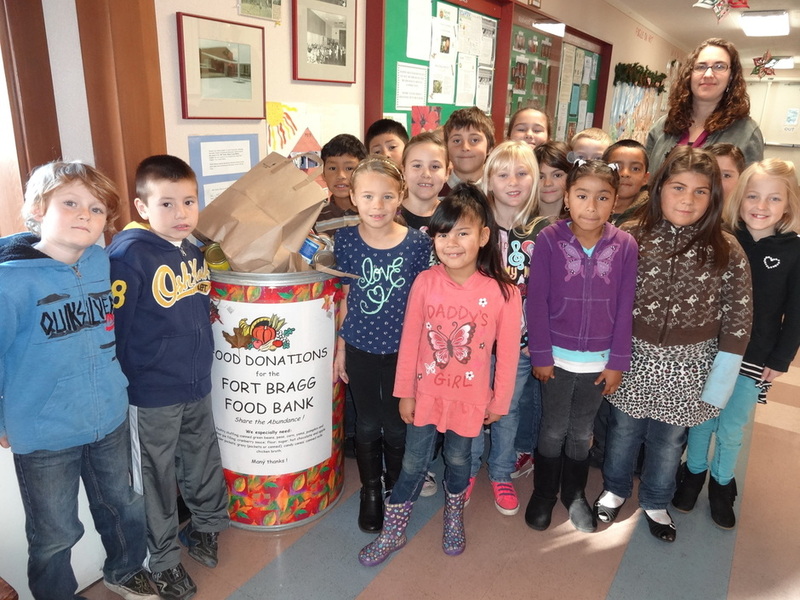 Every year they have generously donated the proceeds to the Fort Bragg Food Bank !!! UMPQUA BANK DONATES $5,000 !!! 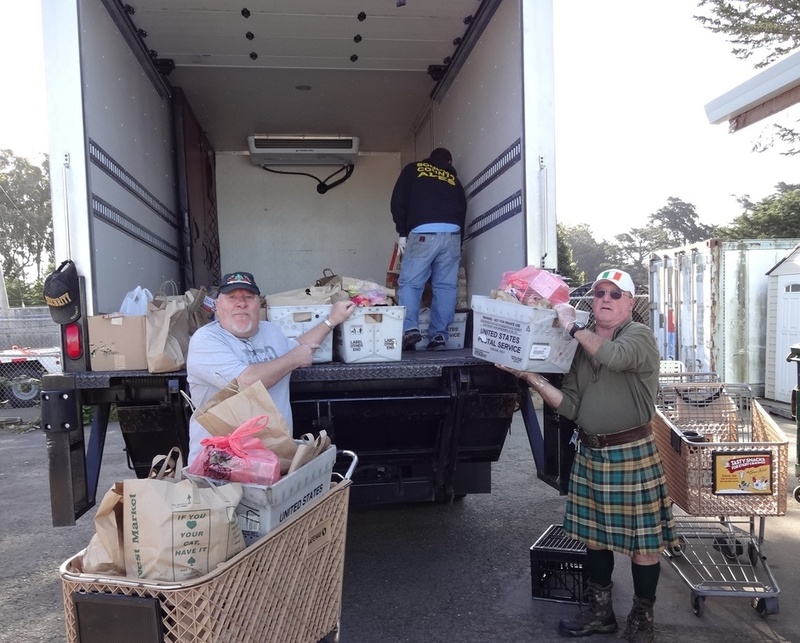 Every Thanksgiving and Christmas the Westport Volunteer Fire Department picks up Holiday Food Bags from the Food Bank and delivers them to Food Bank clients living in Westport and Rockport, saving these folks the time and expense of a trip into Fort Bragg. Pictured here is Fire Captain Frank Maurice. He and Captain Dan Maxey led this generous effort on behalf of their community. 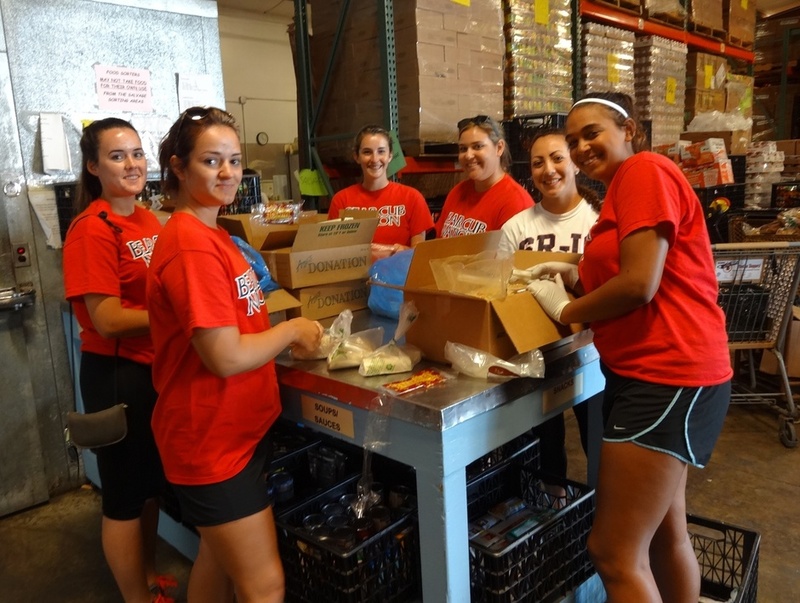 After taking a tour of the Food Bank, One Love Soccer kids help fill bags with food for Food Bank clients. NEW TRUCK ARRIVES: After years of planning and saving we were finally able to replace our old refrigerated truck which we out-grew and which needed expensive repairs. This new 2013 Freightliner will serve our community well for many years to come. Many thanks to all who contributed to the purchase of our new truck. We are delighted to welcome to this world Liam James Friscia, son of Amanda Friscia, our Client-Volunteer Coordinator, and her husband Jason. Pictured here are Big Sister Sienna, Amanda and Baby Liam. Benjamin Abell of Bones Graphics donated his time and considerable talent to create a wonderful new mural for the client waiting room at the Food Bank. Paint donated by Racine's and plywood by Rossi's. We've been concerned about what the upcoming ban on plastic bags will do to our supply of recycled grocery bags. Well, now we have a solution. We were delighted when Jill Lydick walked in the door with a stack of shopping bags she made out of old T-shirts. Not only are they sturdy and useful, but they're downright fun! Now your favorite T-shirts from road trips and rock concerts of yore can live again! We can't wait to start handing these out to clients. If you have old T-shirts you'd like to donate to the cause, bring 'em on down to the Food Bank and we'll pass 'em on to Jill to be turned in to bags. Thank you so much to the local Soroptimists, International groups who have been providing, for several years now, wonderful Birthday Bags for Food Bank kids on their birthdays. The kids just love this! 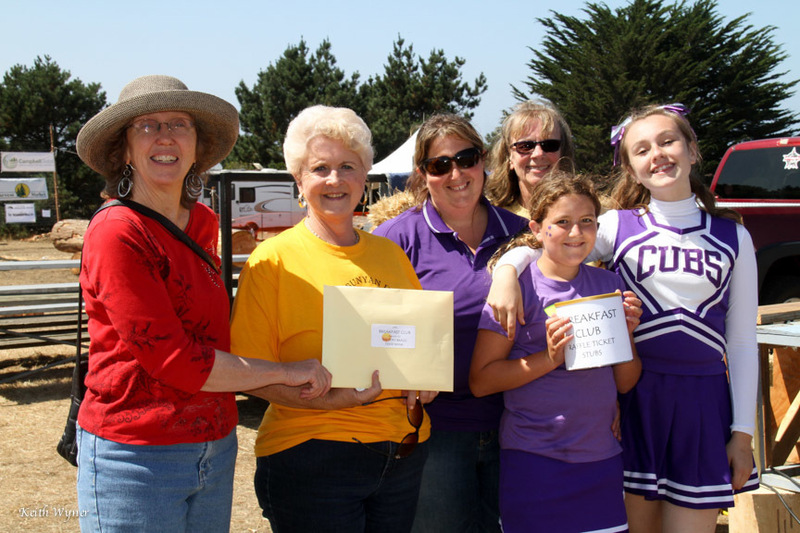 We are most fortunate to have received a grant for $8,200 from First5 Mendocino to buy milk for families of young children. THE FOOD BANK WELCOMES NEW BOARD MEMBER, AMANDA DURIGAN! A big thank you to the men of CalFire Chamberlain Creek Cabinet Shop for making a wonderful new produce rack for the Food Bank ! We are deeply saddened by the passing of James Barker, a valuable Food Bank volunteer. James faithfully tended the vegetables and fruits on our produce rack. Warehouse Mangager, Jim DiMauro, answers questions from Chamber members about our food supplies. Wells Fargo Bank made a generous donation to be used toward the purchase of a much needed new delivery truck for the Food Bank in 2012. Alta Moore of Wells Fargo presents a check to Dan Fowler, Food Bank Board President. Also present from the Food Bank are (left to right) board members: Thom Adams, Ginnie Claus and Glendie Johnson; and Executive Director, Nancy Severy. NEW GENERATOR THROUGH CDBG GRANT INSTALLED! And ain't she a beaut ! Employees of the Savings Bank of Mendocino County held a Holiday Bake-Off with the proceeds (matched by the bank, itself) going to the Fort Bragg Food Bank. Pictured are Ericha Heinsohn-Sevy, Mendocino Branch Manager; Nancy Severy Executive Director- Fort Bragg Food Bank; Ginnie Claus, Fort Bragg Branch Manager, and Jennifer Clark, Bake-off winner - Fort Bragg Branch employee. Thank You Savings Bank! With the help of our generous community we distributed 736 turkeys plus the fixin's for a complete holiday meal to 736 Food Bank client families. Smiles and good cheer abounded on our holiday distribution days. Now.... we're getting ready for the Christmas holiday! This new freezer has 85% more capacity than our old, less efficient freezer. With this extra space we'll be able to secure larger quantities of frozen meat and other foods for our clients. The freezer was purchased with a CDBG grant which we received through the help of the City of Fort Bragg. North Coast Refrigeration did a great job on the installation. With a matching grant from the USDA Rural Development agency we just completed a shelter over our outside produce sorting area. This will protect our volunteers from the elements as they sort through donated salvage produce. The excellent work was done by Rosenthal Construction. WE WELCOME ABOARD THREE NEW EMPLOYEES! Kristen's expertise is in fundraising events. It is with great sadness that we say good bye to Lance Nelson, our Warehouse Supervisor extraordinaire of the past five years. Lance and his daughter, Mary, are moving to Washington State to be closer to family. We wish Lance well and hope he keeps in touch. Food Bank staff were thrilled to receive a forklift donated by Food Bank benefactor, Betty Stechmeyer. 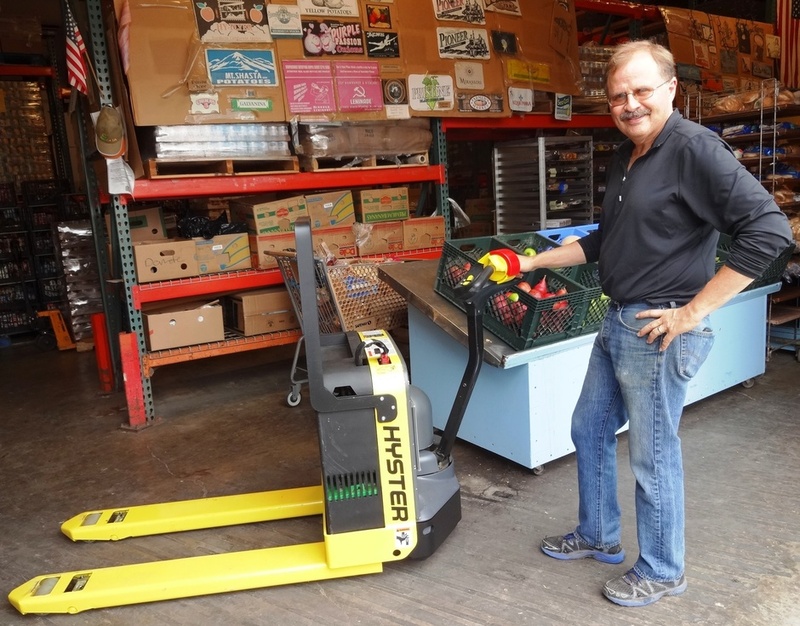 The driver who delivered the used, in excellent condition, American-made Hyster forklift commented he had never before seen any group so excited to receive a forklift. This year's Stamp Out Hunger Food Drive, by the National Association of Letter Carriers, was a big success. 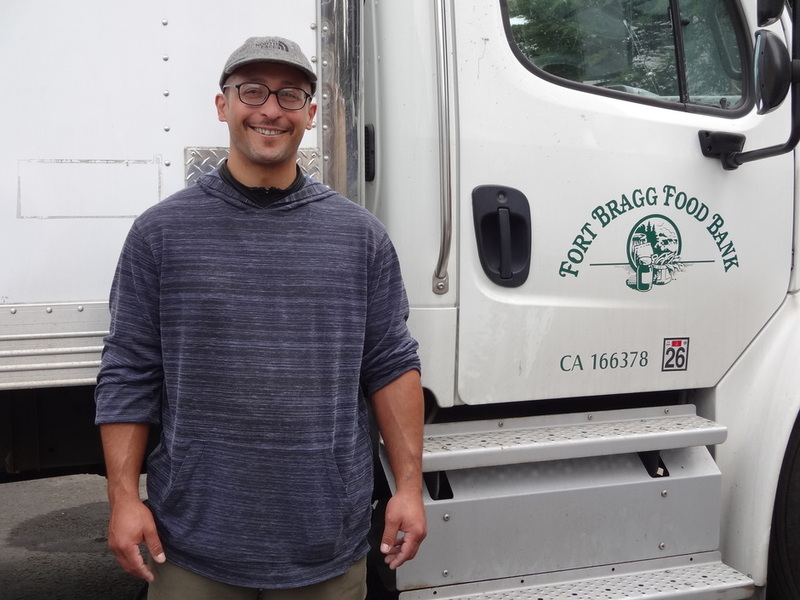 Your very own local mail carriers picked up over 2,000 pounds of food left by by generous Fort Bragg residents next to their mailboxes on Saturday. After unloading a truck full of much-needed food, we realize the amount of extra effort made by our mail carriers to help their friends and neighbors in need! JEAN JONES, the Heart and Soul of the Food Bank for many years, passed away early Easter morning. Jean who retired in 2009, touched the hearts of many during her years at the Food Bank. Her passing will be mourned by clients, volunteers and staff alike. We love you Jean! Frank Langley of the Chico Gleaners has been bringing us surplus bread and gleaned produce from the central valley. Frank and his wife Peggy have taken it upon themselves to be sure that this valuable food does not go to waste. We are fortunate and most grateful to have received an award of $7,500 from the California Endowment. We are deeply saddened by the passing of our "Egg Lady", Marie Rusert. Marie, whose preferred task was washing and repackaging donated eggs, volunteered up until age 94. She will be dearly missed. The Mendocino Coast Frolf Club held its Second Annual Cary Letsinger Memorial "Ice Bowl" Charity Disc Golf Tournament on Feb. 12th at the Fort Bragg College of the Redwoods. Friend and fellow disc golfer, Cary Letsinger passed away five days before the event last year. He was the main fundraiser and the event could not have been as successful without his work. Derrick Robbings, of the Frolf Club said ”We all knew that Cary would have wanted the event to go on.” This year thirty seven people showed up to play, and A.J Buhl, Derrick Robbings, and the whole Mendocino Coast Frolf Club stepped up to raise $1,434, and 800 pounds of food, all of which was donated to the Fort Bragg Food Bank. On our monthly delivery run to Leggett, Laytonville and Covelo food banks, the unexpected happened. Our truck and driver, Joe, were briefly detained by snow on Highway 1 between Rockport and Leggett! Joe made it to Leggett and Laytonville that day, but decided Covelo was too much of a gamble.